"Citizens of this country will now rise and tender a hearty vote of thanks to Columbus for having discovered America""We never appreciated so much as now the foresight exercised by our forefathers in emigrating from Europe""America, being a peaceful nation, cannot understand the war mania which always exists in Europe. "These are a few samples of the editorial captions which appeared in American newspapers during the early days of the World War. "America is a peaceful nation," continues to be a popular slogan. "Well, let's have a look at the record." Every generation of Americans from early Colonial days has had its war. The problem of caring for war's disabled has always been with us. The longest period of peace ever enjoyed by America was for thirty-three years. Five years later, Queen Anne's War, 1702-1713. Thirty-one years later, King George's War, 1744-1748. Seven years later, the French and Indian War, 1755-1763. These Inter-Colonial Wars were the American counterpart of wars in Europe. Twelve years later, the Revolutionary War, 1775-1784, which gave America its independence. Thirty-one years later, 1812-1815, the War of 1812. We were forced into the War of 1812, which might also be called a "World War," over exactly the same disputes that sent us into the last war. Thirty-one years later, 1846-1847, the Mexican War. Fourteen years later, 1861-1865, the Civil War. From 1866 to 1890, there were frequent wars with the Indians. Thirty-three years after the Civil War, 1898, the Spanish-American War. This was followed, 1899-1902, by the War of the Philippine Insurrection, and our participation against the Boxer Rebellion in China, 1900. In 1916, the punitive expedition to Mexico. Sixteen years after the Spanish-American War, 1917-1918, the World War. Since the World War, the sound of American war drums has rolled across Haiti, San Domingo, Nicaragua and China. The public debt in 1917 was less than $3,000,000,000, the per capita figure being $28.57. In 1919, due to the direct cost of the war, the public debt was $26,600,000,000, the per capita figure being $251.60. Due to the economic depression, and the expense of the Recovery Administration, it is estimated that the public debt will reach forty billions by 1940. Up to June, 1933, seventy-two cents out of every dollar of income to the Federal Government was going to pay for old, or in preparation for future wars. If the expense of the "Recovery Program" is indirectly chargeable to war, the percentage is increased. Notwithstanding the heavy tax burden, with war taking nearly three-fourths of the government's income, the United States has never been adequately prepared for any of its numerous wars. Because of inadequate training of its citizen soldiers, America has made needless sacrifice at the altar of Mars. 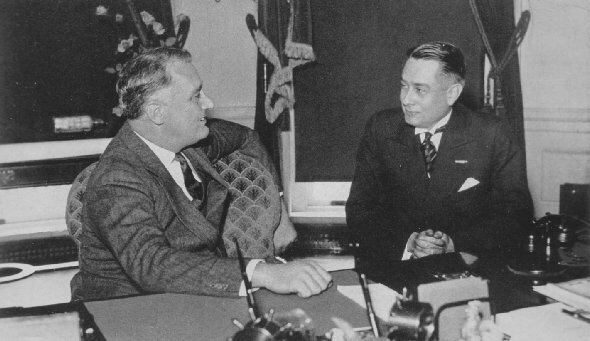 President Franklin D. Roosevelt, in conference with Capt. Joe McQueen, past National Commander, Disabled American Veterans, and member of the Legal Council of the Veterans' Administration. Captain McQueen, who was twice wounded in the Argonne Forest, and cited for gallantry in action, told the President that his organization is interested only in the rehabilitation and care of those whose disabilities are directly caused by war service, and in the protection and perpetuation of the traditions, ideals and principles of Americanism.